For other places in Pennsylvania named Jefferson, see Jefferson, Pennsylvania. Jefferson County is a county located in the U.S. state of Pennsylvania. As of the 2010 census, the population was 45,200. Its county seat is Brookville. The county was established on March 26, 1804, from part of Lycoming County and later organized in 1830. It is named for President Thomas Jefferson. It is home to Punxsutawney Phil, the groundhog that predicts when spring will come every February 2 (Groundhog Day). According to the U.S. Census Bureau, the county has a total area of 657 square miles (1,700 km2), of which 652 square miles (1,690 km2) is land and 4.4 square miles (11 km2) (0.7%) is water. As of the census of 2000, there were 45,932 people, 18,375 households, and 12,862 families residing in the county. The population density was 70 people per square mile (27/km²). There were 22,104 housing units at an average density of 34 per square mile (13/km²). The racial makeup of the county was 98.97% White, 0.13% Black or African American, 0.16% Native American, 0.21% Asian, 0.01% Pacific Islander, 0.07% from other races, and 0.45% from two or more races. 0.41% of the population were Hispanic or Latino of any race. 31.1% were of German, 13.4% Italian, 10.8% American, 9.2% Irish and 7.8% English ancestry. There were 18,375 households out of which 30.30% had children under the age of 18 living with them, 56.80% were married couples living together, 9.10% had a female householder with no husband present, and 30.00% were non-families. 26.60% of all households were made up of individuals and 13.80% had someone living alone who was 65 years of age or older. The average household size was 2.45 and the average family size was 2.96. In the county, the population was spread out with 23.60% under the age of 18, 7.70% from 18 to 24, 27.20% from 25 to 44, 23.60% from 45 to 64, and 17.90% who were 65 years of age or older. The median age was 40 years. For every 100 females there were 95.70 males. For every 100 females age 18 and over, there were 92.60 males. Two Pennsylvania state parks are in the county. Clear Creek State Park is in Barnett and Heath Townships. The Jefferson County Fair is held annually in July. 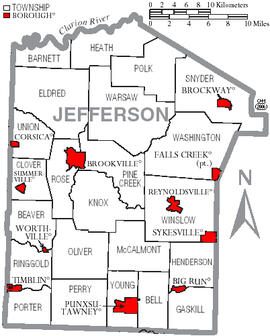 Map of Jefferson County, Pennsylvania with Municipal Labels showing Boroughs (red) and Townships (white). The population ranking of the following table is based on the 2010 census of Jefferson County. John T. Morrison, sixth Governor of Idaho from 1903 until 1905; born in Jefferson County. ^ a b "State & County QuickFacts". United States Census Bureau. Archived from the original on July 12, 2011. Retrieved November 17, 2013. ^ "Pennsylvania: Individual County Chronologies". Pennsylvania Atlas of Historical County Boundaries. The Newberry Library. 2008. Archived from the original on March 25, 2015. Retrieved March 12, 2015. ^ a b Center, Legislativate Data Processing. "Find Your Legislator". The official website for the Pennsylvania General Assembly. Archived from the original on 2017-05-06. Retrieved 2017-05-11. ^ "Idaho Governor John T. Morrison". National Governors Association. Archived from the original on September 10, 2012. Retrieved September 19, 2012. This page was last edited on 4 January 2019, at 00:35 (UTC).